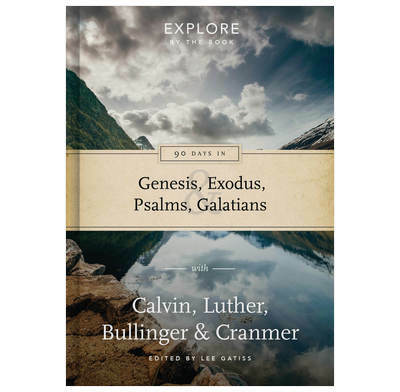 Ninety days of open-Bible devotionals with famous Reformers including Luther and Calvin. Includes space for journaling. In an age when modern devotionals have been published at an exponential rate, untold riches still lie untapped in the commentary, sermons, and devotional writing of our great forbears. This work makes some of the most spiritually penetrating material of the past accessible to readers today. Don’t miss this! Imagine bringing the great Reformers to your house for family or personal devotions. This book comes closest to that. Meditate on God’s Word through these teachers, in simple and succinct but richly profound excerpts, and fresh wind will fill your sails. I’d love to say that I regularly read the writings of the Reformers but it wouldn’t be true. This Explore by the Book, however has the power to change that for me and many others as Lee Gatiss presents readers with 90 days worth of pearls from the writings of key Reformers that help us to grasp and cherish and apply truths from God’s Word. Great idea, bringing the reformers teaching to life. Especially impressed by Luther on Galatians. Superb. I have found the teachings very interesting and have just finished a study in revelation.